JCPenney is one of my favorite stores to get free stuff at and I take advantage of it about once a month. There are lots of great JCPenney freebies offered all year including coupons to get you free stuff, freebies from the JCPenney Salon, free portraits from JCPenney portraits, free beauty samples at JCPenney Sephora, and free stuff just for showing up to JCPenney on Black Friday. JCPenney sends out some great coupons that you can use to get free stuff in their stores. About every month, they send out a pamphlet that will have a few coupons inside of it. Some of the time, you'll find a $10 off $10 coupon that you can use to get free stuff. To use the coupon, you'll need to spend at least $10 and the cashier will take $10 off that purchase when you checkout at the register. If you find something that is $10 even then you won't have to pay anything, if you find something over then you'll have to pay the difference. I usually pick up items where I only have to pay only a few cents. When I get one of these coupons there are certain items I like to look at that I know are around the $10 mark so I can get something for free or very close to it. I like to look at jewelry, scarves, socks, gloves, umbrellas, sunglasses, underwear, coffee mugs, and any other item that's inexpensive. If you don't see anything for yourself, keep in mind those small gifts that you usually need around the holidays. The coupon does have restrictions for certain brands on it so read the fine print carefully. Some of the coupons can be used on clearance and some restrict it. You do not need to have a JCPenney credit card, you only have to be on their mailing list. You can sign up for their mailing list creating an account at the JCPenney website. Make sure that you've indicated that you want to receive mailing and communication from them. JCPenney has a rewards program, JCP Rewards, that allows you to earn free coupons on the purchases you make at JCPenney. In the program, each point is equivalent to $1. When 100 points are earned, you'll receive a free $10 reward coupon. You'll need to provide your email or phone number when you checkout at JCPenney to have them count towards your points. There are frequently promotions to earn double points, so be sure to watch your email and mailers for that information. They also have shoe and bra rewards so if you frequently buy these items at JCPenney, you'll get a $15 off $15 coupon after you buy a certain amount. Many JCPenney's now have a Sephora located inside of them. You can get lots of freebies at Sephora including free samples, birthday freebies, and free beauty perks. If you're engaged, you can head over to JCPenney Portraits and print off a coupon that will get you a free photo sitting as well as a free 8x10 enhanced photo. No purchase required. JCPenney also has a military freebie where you can present your military ID and get a free 8x10 portrait with no sitting fee. 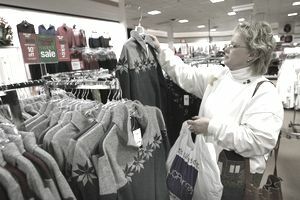 Each year on Black Friday, JCPenney gives out freebies. Some years they give out free Disney Christmas snow globes or freebie coupons to the first customers into the store. These are available while supplies last and you'll want to check with your local store to find out how many they have to give away. When you can't get it for free, it's extremely easy to get it for cheap at JCPenney. Here are some tips on how you can save even more next time you shop at JCPenney. Take a Survey - Look at the bottom of your receipt next time you buy something at JCPenney. Many times you'll find a code to take a survey and as a reward, you can get coupons and discounts. Use coupons - Even if you don't get those freebie coupons in the mail, check out the JCPenney website and look for coupons that you can print out and take to the store or use online. They almost always have one available and it will be promoted at the top of the homepage.